These packs sometimes available on the Defiance Store are also purchasable outside of it. 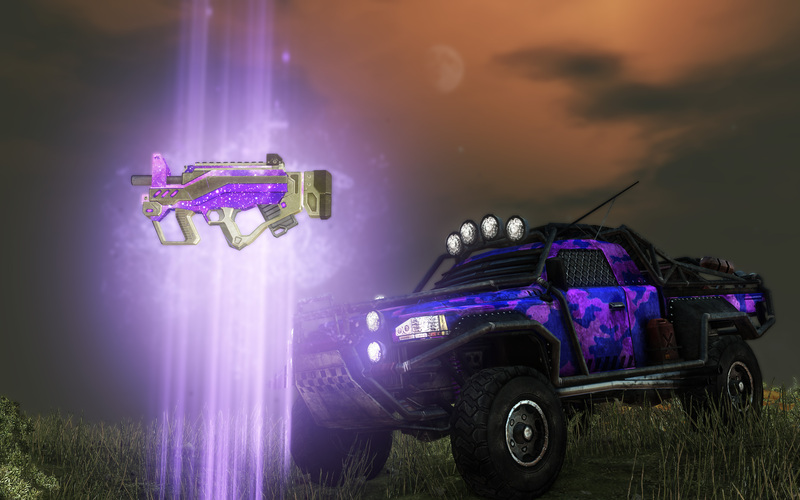 Thanks to Xellia for the great thread at: http://forums.defiance.com/showthread.php?252380-Past-Vanity-bundles. Do your implants twitch in the presence of arktech? Does a Jackpot Big Boomer make you weak in the knees? Stalk the New Frontier at the peak of your game with this legendary ark-full of loot. To go along with the Winter Bash Update, we’re also releasing the brand new Arctic Assassin Pack! Available for 2600 Credits, this pack ensures your hunts throughout the cold winter months will be fruitful. ‘SB-32 Freezer Burn’ (image) An incendiary detonator that fires snowballs. Burn and freeze your foes at the same time! ‘Arctic Assassin’ Outfit + Headgear. This stylish combo allows you to blend in with your surroundings during the winter months, and look quite dapper the rest of the year. Only available during the Colony Courtship event. 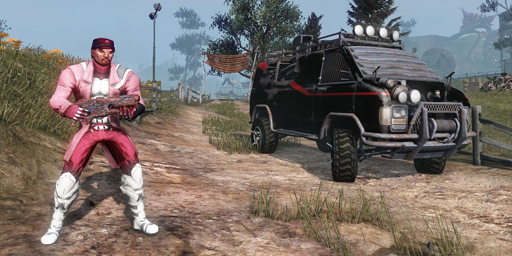 Features an Epic EVO Nano Fragger, the Bubblegum Killer outfit, the B-Squad Van and B-Squad title. RM Nomad V6 "Black Market Operative"
Utilizing the latest Grid Technology, you’ll literally take your enemies apart with cutting edge tech, while looking every bit the part! Nuzzle the muzzles of the same epic new weapons, plus a Legendary Tachmag Pulser SMG, special Duni Shetarru vehicle, and more. Once you evolve, there’s no going back! Only available during the Hot Crazy Summer event! Get it now before it's gone! Contains: Hot Blast Hatcher, Corporate Valentine Outfit, BRAND NEW Hoverbike - TMW Falcon Red/Black, "Falconer" title, 18 Loyalty. Starting later today, and running through November 30, the New Frontier will be celebrating the New Frontier Harvest with exciting events and special new pack. The Frostbringer Pack is only available during the Solstice Strike event from the Defiance Store and features a Snowman Launcher, Gift Detonator, vehicle and title. The New Frontier Harvest event returns and we’re thankful for awesome ark hunters, a brand new Synergy, and special new holiday pack! Tradable "Obliterator" Radiation Jackpot Surge Pulser SMG*. This brand new weapon type fuses the fast firing tachmag pulser with the surging blast rifle! Increases damage as your health decreases. Max of 25% damage and 30s duration. Tradeable "Obliterator" Radiation Jackpot Surge Pulser SMG*. This brand new weapon type fuses the fast firing tachmag pulser with the surging blast rifle! Do you live for fire(works) and freedom? Get a Paradise Patriot Pack for special launchers, Spikes, Liberty gear and more – available for 2,600 Bits now through July 12! Show your passion this season with the new Passionate pack! The Shrill Hunter Bundle is now available in the Defiance store with a new outfit, vehicle, and weapon to help you blast your way through the new Dark Metamorphosis update. Legendary "The Great Pumpkin "Launcher"" Rocket Launcher. Fires super slow moving MASSIVE pumpkins! Wreck the Halls pack is a limited time Arkhunter Bundle only available during Solstice Strike. It features a snowball firing rocket launcher, a sugarcane charge blade, a cybernetic santa outfit, a truck and more.